A scout view of the abdomen revealed a single prominent segment of small bowel in the upper abdomen, but no other abnormalities (Figure 1A). Delayed overhead images from an upper gastrointestinal (GI) series demonstrated a dilated proximal jejunum and multiple ovoid filling defects occluding the bowel lumen (Figure 1B). 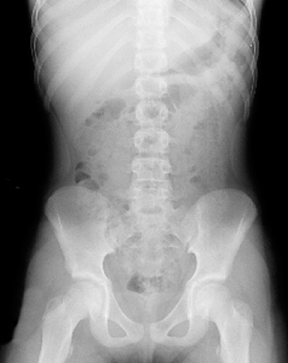 The most distal of the filling defects appeared to have a thin barium tail extending into the distal bowel. Further delayed images showed no passage of contrast beyond the filling defects. Trichobezoars form in the stomach where hair is trapped proximal to the pylorus. 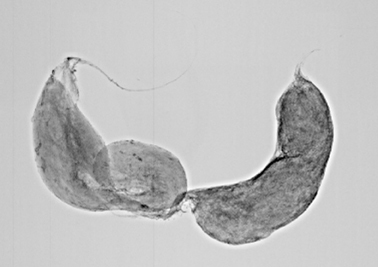 Aggregated mats of hair subsequently conform to the gastric contours and may eventually cause vague abdominal pain, gastric outlet obstruction, ulceration, or perforation.1,2 They can also grow to massive proportions, filling the gastric lumen and presenting as large abdominal masses.3 Occasionally, trichobezoars form tails that extend through the pylorus. In rare cases, these tails extend as far as the terminal ileum and may cause small bowel obstruction, a complication known as Rapunzel syndrome.4 Although they usually remain in the stomach, a small trichobezoar or fragments of a larger trichobezoar may migrate into the small bowel, causing obstruction (Figure 2).2,5 Given the diversity of possible complications, the presentation of trichobezoar can be quite variable ranging from asymptomatic abdominal mass or vague abdominal pain to obstructive symptoms or acute abdomen. Trichobezoars are a relatively rare entity that may have a protean presentation. In the pediatric population, it can be considered in the differential diagnosis for any patient with an abdominal mass, vague abdominal pain, obstructive symptoms, or an acute abdomen. Kirks DR, Griscom NT. Practical pediatric imaging. 3rd ed. Lippincott Williams & Wilkins, 1998;909-910. Debakey M, Ochsner A. Bezoars and concretions: A comprehensive review of the literature with an analysis of 303 collected cases and 8 additional cases. Surgery. 1938;4:934-968. Ciampa A, Moore BE, Listerud RG, Kydd D, et al. Giant trichophytobezoar in a pediatric patient with trichotillomania. Pediatr Radiol. 2003;33:219-220. West WM, Duncan ND. CT appearances of the Rapunzel syndrome: An unusual form of bezoar and gastrointestinal obstruction. Pediatr Radiol. 1998;28:315-316. 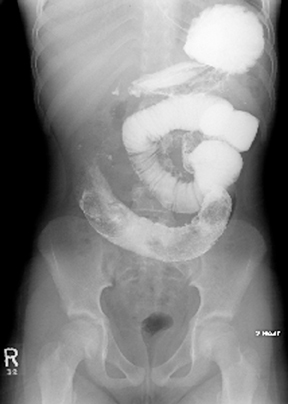 Krol CM, Karol I, Khalil H, Shah S. Small-bowel obstruction due to migratory trichobezoar in a child: CT diagnosis. AJR Am J Roentgenol. 2001;177:255-256. Gayer G, Jonas T, Apter S, et al. 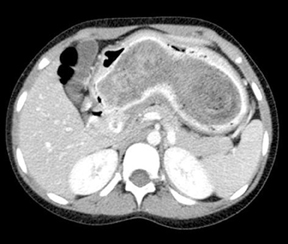 Bezoars in the stomach and small bowel—CT appearance. Clin Radiol. 1999;54:228-232. Silverman FN, Kuhn JP. Caffey’s pediatric x-ray diagnosis: An integrated imaging approach. 9th ed. Mosby. 1993;1052. Newman B, Girdany BR. 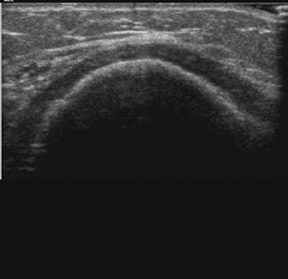 Gastric trichobezoars—sonographic and computed tomographic appearance. Pediatr Radiol. 1990;20:526-527. Shawis RN, Doig CM. Gastric trichobezoar associated with transient pancreatitis. Arch Dis Child. 1984;59:994-995. Mekisic A, Farmer E. Trichobezoars. Aust N Z J Surg. 1994;64;281-283. Katapadi M, Kostandy G, Wang A, et al. Can a bezoar cause acute pancreatitis? J Clin Gastroenterol. 1997;24:120-121. 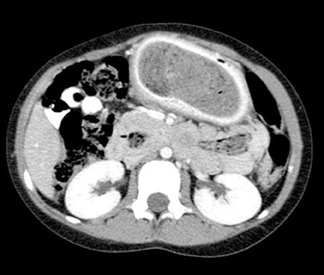 Transient pancreatitis and small bowel obstruction by trichobezoar. Appl Radiol.